A Star Is Born may be the most iconic of all Hollywood stories. The current movie is the fourth version of the film. The movie was previously filmed in the 1930’s, 1950’s (with Judy Garland), and the 1970’s (with Barbra Streisand). Basically, this is the story of an established Hollywood celebrity (actors in the first two versions, rock musicians in the second two), who meet and fall in love with younger, talented women who aspire to show business. The older man mentors and eventually marries the younger woman. As her career takes off, his career begins to fade. It’s a great story about fame and celebrity, as well as the effects of ego and jealousy, mixed with alcohol and (in the later versions) drugs. Surprisingly, the story still works 80 years after the first movie. And the new movie, despite being a little long, with a few slow patches, works very well. Bradley Cooper was responsible for bringing this version of Star back to the screen. Not only does he play Jack, the male lead, but he also produced, directed, and co-wrote the screenplay and some of the songs. As Ally, the female lead, pop singer Lady Gaga makes a great screen debut. Both give great performances, and even sing together. Who knew that Cooper could sing? Cooper plays Jack, a rock singer, who stumbles by mistake into a drag bar after a concert looking for a drink. He finds Ally, who sings in the bar. Jack is impressed by Ally’s great voice, and they talk. Jack falls for Ally, who is amazed and a bit befuddled that a famous, handsome rock star would be interested in her. The early scenes between Jack and Ally beautifully set the tone for the rest of the movie. Ally has written several songs, but tells Jack that she doesn’t have the confidence to sing them in public. She has been told that she could never make it in show business because of her big nose. Jack brings her backstage to his concert, then coaxes her onstage to sing her song with him. The crowd goes wild when they hear Ally’s powerful voice. Ally and Jack blend together so well, that Ally starts to sing more and more at Jack’s concerts. Ally is soon approached by an agent who wants to sign her to a recording contract, followed by her solo tour. Ally and Jack marry and deal with the stresses of dual careers. Jack is at first very supportive, but then becomes jealous as Ally becomes a star on her own. Tensions grow, especially as Jack begins to turn to alcohol and drugs more and more. As Ally’s star rises, Jack’s begins to fall. In his directorial debut, Cooper balances both the big concert stadiums with the more intimate moments. As good as the big events are, it’s the smaller, more personal scenes that I remember most about Star. Gaga is convincing in her film debut. She is awkward and self-conscious at first, but her confidence grows throughout the movie. Curiously, the only scenes that don’t quite work are the ones in which Gaga comes closest to her own onstage persona, singing and dancing in videos and on television. As good as Lady Gaga is, the heart of this Star Is Born is Bradley Cooper. Even when Jack is at his worst at the Grammy Awards, Cooper makes you feel for Jack. The writers have given Jack his own tragic family story. Jack’s mother dies in childbirth, and he was raised by his older brother (Sam Elliott), who becomes Jack’s manager. Even as he seems to come back from rehab successfully, Jack is dealt a cruel blow. Cooper plays this scene, and all his scenes, beautifully. 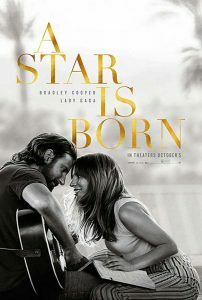 Months ago, when I heard that they were making a new film of A Star Is Born, I thought this was a terrible idea. I’m happy now to say that I’ve been proven wrong. Cooper, Gaga, and everyone involved have given new life to a classic story. The only update I wish they’d left out is the pervasive profanity, which adds nothing to an otherwise very enjoyable movie.